I have enjoyed Vernian Process’ music since I first heard their 2010 album Behold the Machine. 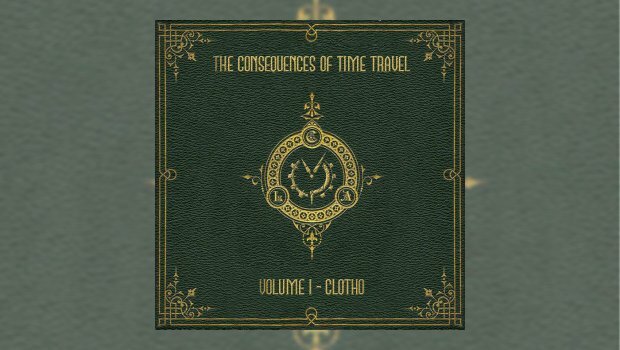 Although originally tagged as steampunk, this is an avant-garde band formed in San Francisco in 2003, taking their name from the works of 19th Century author Jules Verne. The band composes and performs music in multiple genres including Post-Punk, Prog-Rock, Darkwave, Deathrock, Trip-Hop, Cabaret, Industrial, Goth-Rock, Steamwave, and of course Steampunk. This album has jumped into an early lead for my favourite album of 2019, but it is early days as I received it on New Year’s Day. It has been on my computer and in my car ever since. I wouldn’t say I have all the lyrics mastered yet, but every track on this album is perfect. It stunned me, first with the announcement of its ‘conception’, then with how rapidly I received it, and it’s a stunning album that takes you to many places, both of and beyond this world, from the headphones of your easy chair by the fireside to anywhere you wish to go. But wait, there is more! Vernian Process are due to release Volume II: Atropos and Volume III: Lachesis before the end of the year. Can’t wait! The three-volume set will be based loosely on the ancient Greek goddesses the three Moirai: Clotho, Lachesis, and Atropos. Clotho spun the thread of life, Lachesis measured the thread and allotted it to each member of humanity, while Atropos was the cutter of the thread who chose each person’s manner of death. Ready? Let’s get this party started. Chronostasis (Overture) opens like you would expect a title dealing with time, the tick-tock of a clock, before grand, symphonic, movie soundtrack orchestration fills the room. Do a Google search for the term ‘chronostasis’ and I’m sure you will remember witnessing it in your own life. The music is dreamlike and sets up a wonderful ‘theatre of the mind’ effect, which if you are like me, will inspire you to put it on repeat. It’s especially good in the car, driving through a city or the mountains. The Consequences of Time Travel (Part 1) continues the music from the first piece, until it switches to a wonderful Mission UK power drive song. I’m not sure if this band know Mission UK, but I sense an influence here. Power drums, bass, lightning lead guitars, but it’s the volumes of keyboards that I’m focused on. Another ‘theatre of the mind’ experience that this band and genre are well known to stimulate, a steampunk/dark metal symphony, true to their original genre and coming at you at the speed of sound. The Crimson Veil opens with a very cool echoing keyboard effect which foretells that things are going to change, and dramatically. This one has a danceable beat and plenty of profound orchestration surrounding the main melody and music. A power rhythm track that quickly develops into a Quentin Tarantino, ‘Pulp Fiction at a bull fight’ sound. The brass takes over for a minute, then slow and beautiful acoustic guitar that changes to flamenco, complete with maracas and all the visions and sounds, including the bull, that place you in the ring. Or hopefully, for your sake, in the audience. Emerald Fields is my favourite track on the album. It slowly weaves its reggae rhythm through your ears and mind. The message is powerful in the lyrics, opening with the words on The Statue of Liberty, “Give us your tired, your huddled masses, yearning to be free…”, then the song confront the realities of 2019… “and we will suppress them, we will oppress them, we will divide them… silence is the key”, all set to an excellent reggae beat. Rapper Jamie Brewster adds a tip of the hat to Bob Marley’s famous song Get Up, Stand Up, song to help enlighten all to the hypocrisy of locking up millions of people over marijuana use, which has now been legalised in many territories. The incarcerated are not released, “Still in cages. It’s outrageous!”. Everything you could want in a new year full of hopeful changes. Fractured Memories is a short Victorian keyboard stroll through a marketplace, soft piano and strings with the reminder of the tick-tock of the clock, counting out the life proceeding onward. In the Looking Glass is a reference to the famous tale Alice in Wonderland. It is a wonderful dreamy ride down the rabbit hole into imagination. Later, it turns into a heavy electric guitar solo that will stay with you well after completion. Jade Ruins is an instrumental full of Aztec instruments and drums, haunting jungle special effects and accompanying birdsong, and Scarlet Twilight features gulls and the sounds of the ocean drifting to shore, while slow guitar and keys help create a warm and tranquil closing instrumental chapter to this first album in the sequence. Go and get this album. A treasure trove of mystery and some of the best music of 2019 already. I can’t wait for part two!